It may only be September but it’s starting to look a lot like Christmas in the Bash Booth! 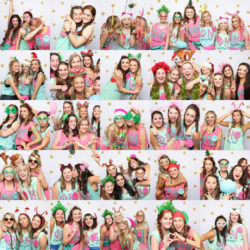 Phi Mu’s Christmas-themed Bid Day was so much fun to work with! We created custom ‘Phi Mu’ props plus a white and gold polka dot backdrop and Christmas props to complement their theme.